These have 3 wires pushed together to allow light doughs to pass through and not jam up your whips. For light cookies, muffins, quick breads etc. Great for pastry. Sold as a set of 2. Tip: Bosch recommends using the wire whips and batter or cookie whisks for pourable batters. 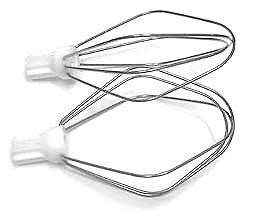 The batter whisks (DB2's) are a bit stronger than the wire whips for "heavier pourable" batters. For cookie batter, the best choice by far is the new Cookie Paddle accessory (shown just above.) For maximum whipping action in lighter foods, the original DB3 wire whip is certainly the best tool. Wire whips and batter whisks are not warranted because the Bosch mixer is easily powerful enough to bend them to smithereens if they're used in heavy batters.